As a professional association, EMPA offers you up-to-date information, useful resources and valuable protection. Practitioner Directory — As a member, you are automatically included in the Practitioner Directory. This holistic practitioner directory allows the public to find you, helping you build your practice. An advanced search feature increases the public’s ability in finding the right practitioner for their needs. Your profile allows additional features such as a link to your website and email. Members Only Facebook Forum — Connect quickly and easily with other members with questions you may have or subjects you wish to discuss through the Member Forum. Join us here. News — Staying informed is important! 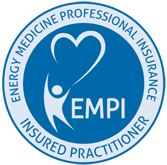 EMPA helps you stay up-to-date on the latest news that relates to your Energy Medicine practice including research, legislation and other relevant happenings. Tips and Tools — This section is designed specifically for the practitioner. From information on how to set up your office to ethical considerations, you will want to check out the tips and tools for Energy Medicine practitioners. Insurance Renewal — It has never been easier to renew your insurance. Your profile populates your current data to your renewal application. Needed changes are easily completed and you can pay online. Renewal is only available when the new policy is released. Don’t worry we will keep you informed! Free subscription to Energy Magazine — Energy Magazine is on the forefront of Energy Medicine, with informative articles catered specifically to the energy healer. Don’t miss out. Subscribe and have it delivered to your inbox every other month to enjoy the wealth of information included. Insurance Badge - Proudly display the fact that you care about the well-being of your clients and carry liability insurance. Click here to get the badge for your website.